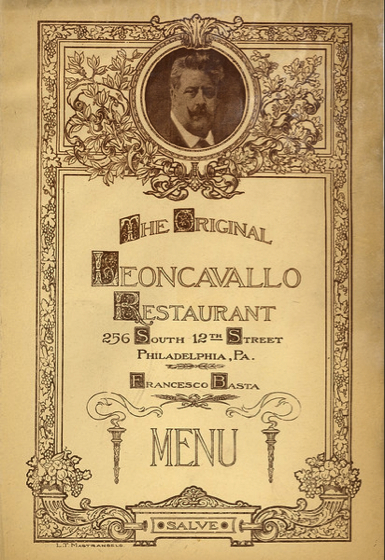 If you’ve ever taken your eyes off the hunky doormen and looked above the front door at Icandy at 254 S 12th St., you’ve noticed an intriguing inscription on the façade that reads “THE LEONCAVALLO.” Did you ever wonder what Ruggero Leoncavallo, the composer of “Pagliacci,” has to do with a gay nightclub? Well, here’s the story. . . The single building you see now is really two rowhouses that have been joined together; numbers 254 and 256. If you look at the roof line, you’ll see the difference; 254 has a fourth floor. In the 1890s, 254 S 12th St. was home to the William and Emma Warrick family. The Warricks were very successful upper middle class African-American entrepreneurs – they owned one of the first chain of barber shops and beauty salons in Philadelphia and Atlantic City. Their daughter, Meta Warrick Fuller, left, studied at the Pennsylvania Academy of Fine Arts, then in Paris. 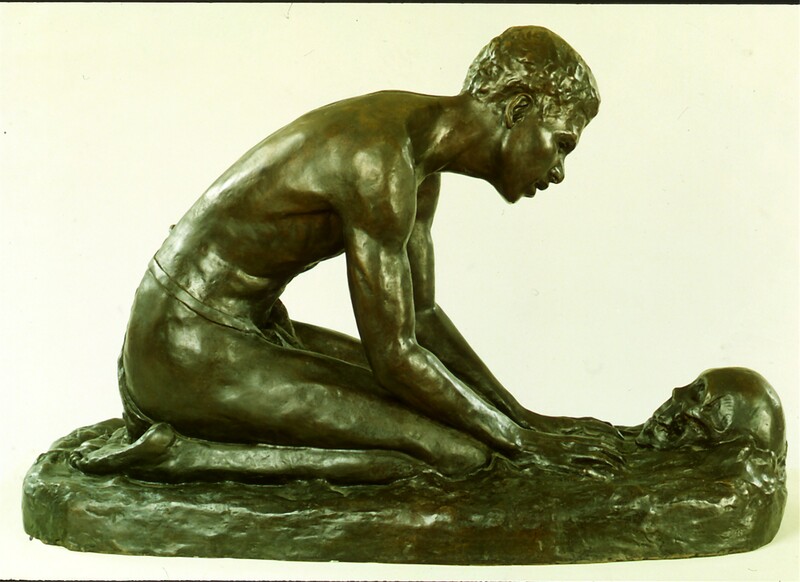 She became one of the first leading black female sculptors in America, creating powerful pieces that celebrated African-American themes and folktales, below. It’s her state historical marker that you see in front of the building. Around the turn of the last century, number 256, next door, was home to a medical institute that treated “female ailments.” These “ailments” included everything from menstrual cramps to superfluous body hair to unwanted pregnancies. The staff always included female physicians, and long-term patients could board there. There were dozens of these tiny “clinics” all over the city. Dr. Elizabeth Conde, who ran this one, advertised regularly in the Philadelphia Inquirer, below. 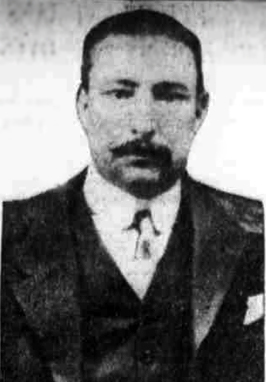 In 1904, in a grisly and shocking turn of events, Dr. Conde, whose real name was Elizabeth Ashmead, was arrested along with her son and Matthew McVickers who also worked there. They were charged with multiple counts of malpractice, including covering up the deaths of several young women. 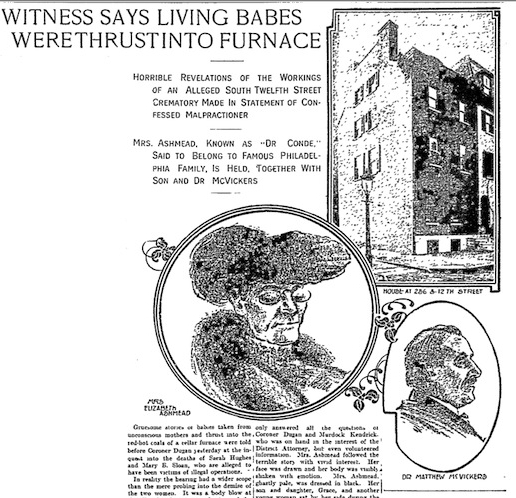 Another member of this citywide “syndicate,” David Mosier, gruesomely accused her of disposing of live aborted babies in the basement furnace, below.Both Mosier and Elizabeth Ashmead were convicted. She served three years in Eastern State Penitentiary, emphatically denying all allegations. During the lurid trial, the rest of the infamous Ashmead family had to move out of the 12th Street home to avoid publicity; neighbors and strangers would come by to point at the house and “women shuddered at the sight of its sedate brick walls.” The empty building was broken into several times and plumbing and gas fixtures were stolen. After serving her sentence, Elizabeth Ashmead was caught again at least twice trying to set up “clinics” both in Philadelphia and later in Millville, New Jersey. 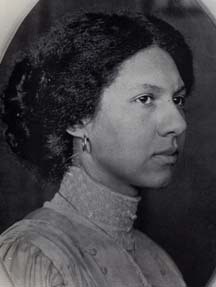 In 1911 she was convicted of using the mails for illegal purposes in Wilmington, Delaware and was sentenced to five years in the Kansas State Penitentiary. That’s the last we see of Ashmead, aka Dr. Conde, in this area. The plate glass window at 256 reads “Original Leoncavallo Restaurant, Frank Basta, Cook.” The simple sign readings “GOWNS” in the window of 254 advertises the dressmaker who lived there. 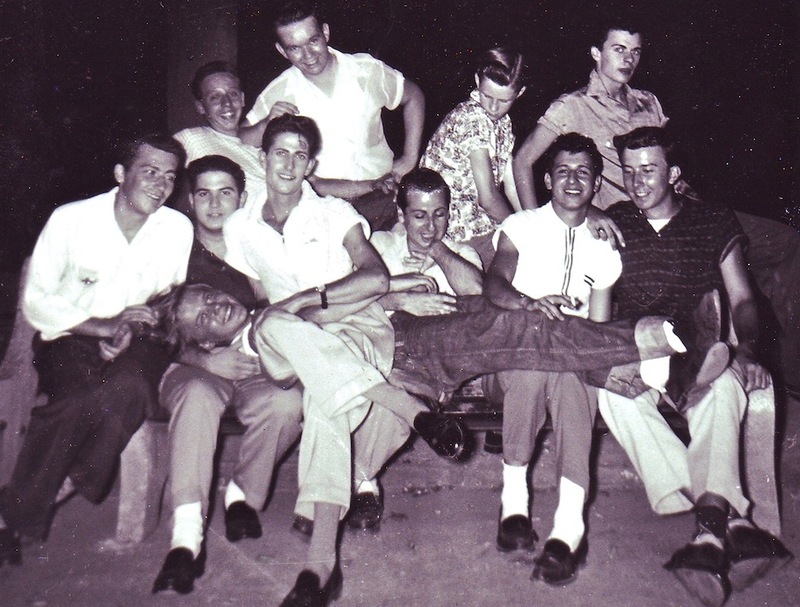 So, What’s the Oldest Gay Bar in Philadelphia? 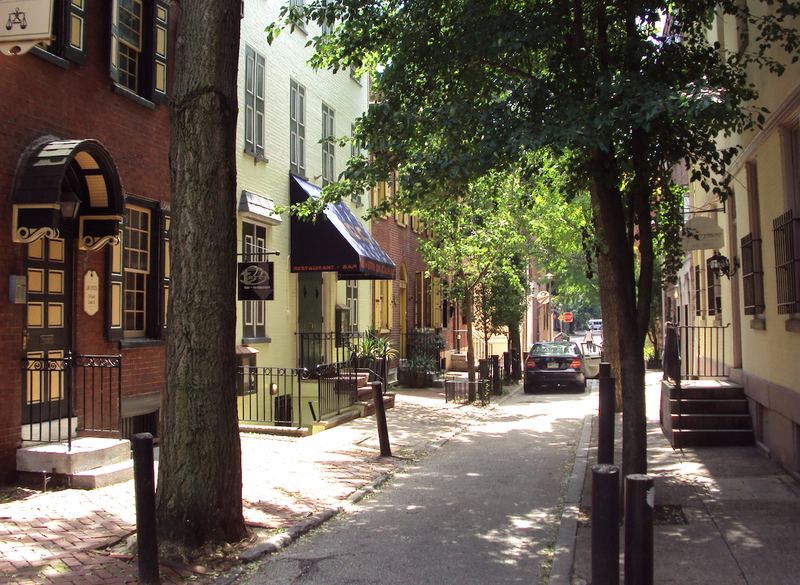 For the answer to our second question, though, we’ll probably have to look in the heart of the modern Gayborhood on quiet, tree-lined Camac Street. Many of the tiny two story houses on Camac Street date from the early 19th century, when the narrow thoroughfare was called Dean Street. Its intimate scale and old fashioned feeling gave it a special appeal to the many literary, advertising and art clubs that made the street their home in the late 19th and early 20th centuries. 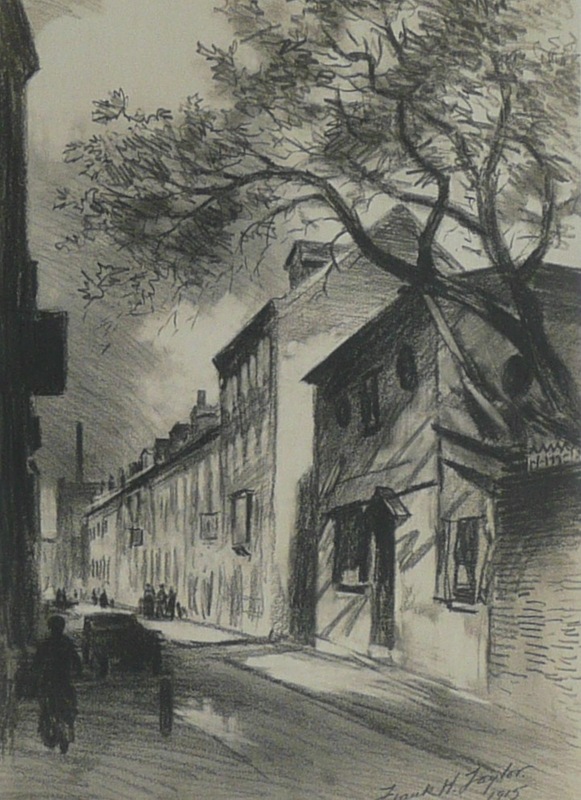 By 1915, the Stragglers’ Club, the Poor Richard Club, the Franklin Inn, the Sketch Club and the Plastic Club had all settled there, (see the sketch by Frank Taylor, left). 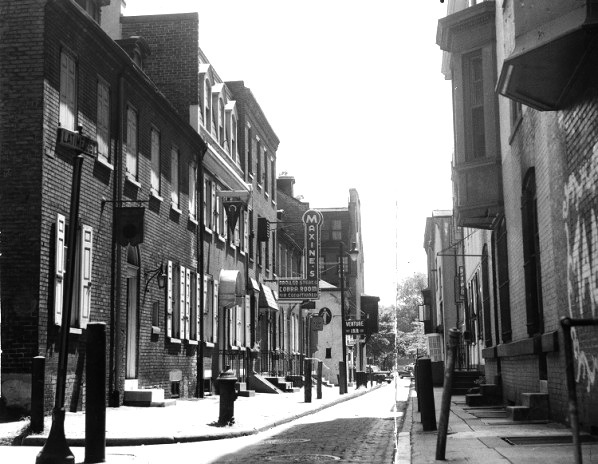 Soon the “Little Street of Clubs,” as it was called, had the reputation of being Philadelphia’s own bohemian district. During the 1920s, under national Prohibition, in addition to the clubs, Camac Street was home to odd little restaurants, quaint tea rooms and of course, speakeasies. From 1920, when it took effect, until 1932, when it was repealed, Philadelphia pretty much dealt with Prohibition by ignoring it. Some estimated that there were over 12,000 speakeasies in the city. Whenever I’m asked if there is a place I could point out that was a former Philadelphia speakeasy, I always say it would be harder to find a place in the city that wasn’t one. 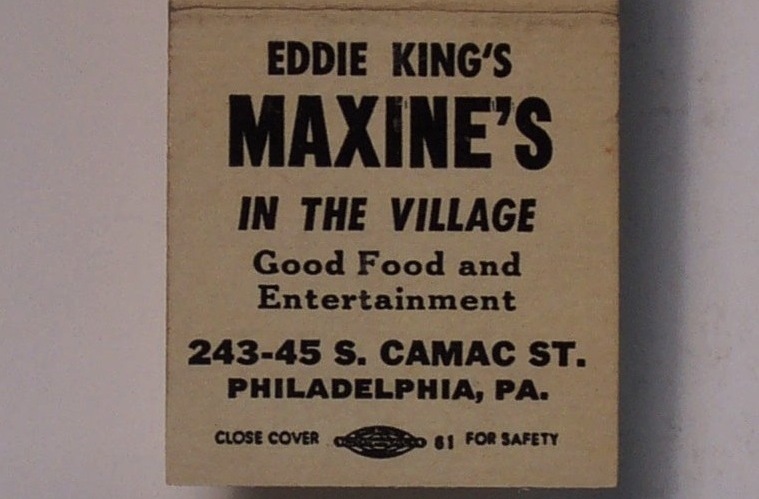 It was during this brash and lawless period that we first have documentation of the existence of a speakeasy called Maxine’s owned by Ed King at 243 S Camac St. Now, speakeasies were operating beyond the law, in dark alleys and hidden cellars, beyond respectable society. They were places where, for almost the first time, men and women and blacks and whites could drink and socialize together. They also created semi-public spaces where a new emerging minority would be welcomed, or at least tolerated: those “long haired-men and short haired women,” that we would label gay today. This also helped give rise to a new nickname for the Camac strip in the 20s: “Philadelphia’s Greenwich Village” (see matchbook, above). of Maxine’s speakeasy, just to the left of the lamppost. Toward the end of the 70s, the bar and restaurant declined a bit, getting the reputation for being a seedy, second-rate place; it was time for Ed to retire. He had been running the bar for over 40 years and had been employed in it for 10 years before that. 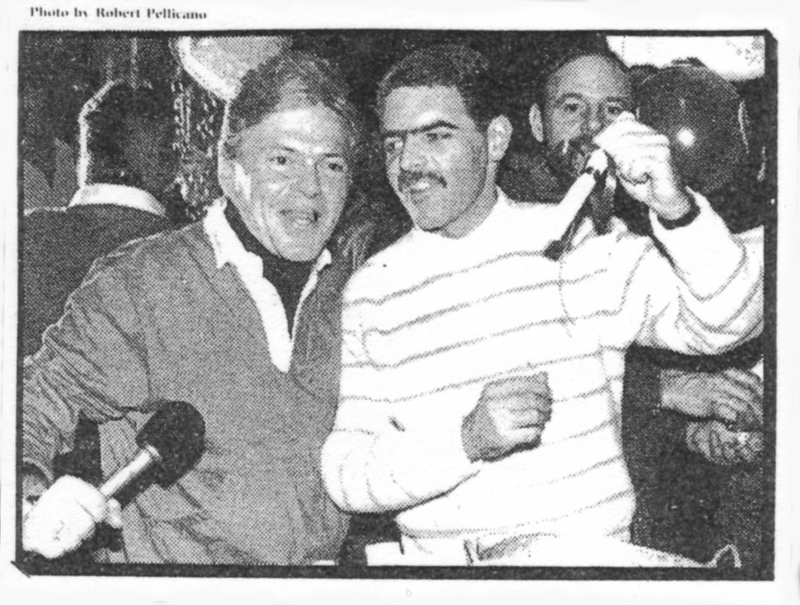 In 1982, Maxine’s was bought out by a gay male couple: Ed Klarin, (below, left in photo), who had been a vice-president of Adolfo clothing and a regular at Maxine’s and his lover Louis Rodrigues, who managed a chain of beauty salons. They re-opened the space as Raffles. They refurbished the entire interior space, which now had four bars, a piano played by Kay Klarin, a dance floor and pub dining in the basement. (See photo, above,right, of the opening of Raffles in April of 1982). Raffles would gain a reputation as a party bar, Klarin and Rodrigues gave endless theme parties. 1983, for instance, featured a different color theme every week and once a year they gave a “Bartenders’ Ball” for all the workers at gay bars in the city. The most infamous character at Maxine’s/Raffles was Mary Estelle Shepard, left, much better known as Mary the Hat to her friends, from the outlandish hats she wore every night. She had worked at various bars around town in the 70s and 80s, including Maxine’s. Mary claimed that when she began at Maxine’s, she didn’t know it was a gay bar, but the truth was that she had begun working for Barney Zeeman at the Forrest many years before. 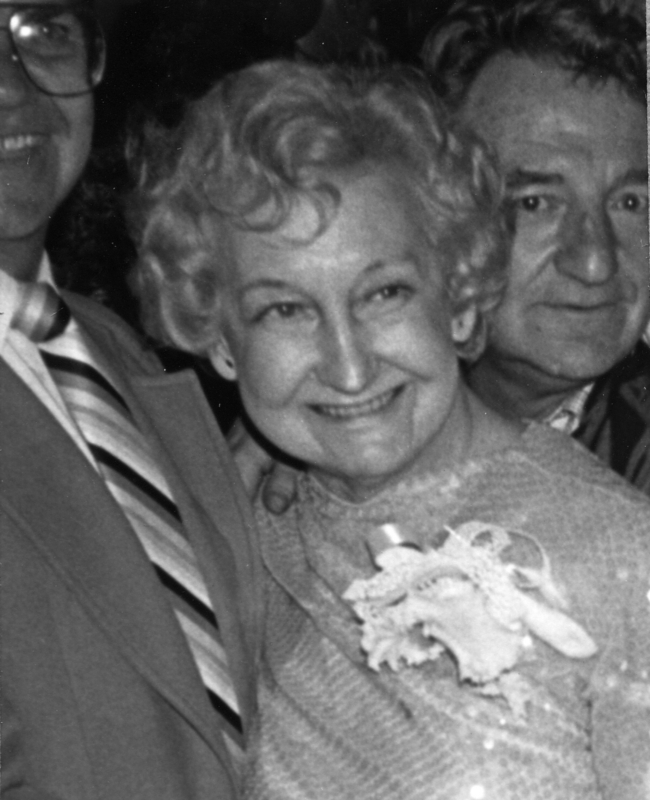 When she died in 1984, no one had any idea how old she was. She eventually moved into an apartment directly across tiny Camac Street from Maxine’s. She’d drink all night, and when it came time to go home, if it were raining she would call a cab. When the cab arrived, barely squeezing down narrow Camac, the driver, who was a regular, would help her down the steps and into the cab. She’d then slide across the back seat, the driver would open the other door and help her into her apartment. She’d always pay him two dollars which he would give to the Maxine’s doorman to return to her the next day. I’ve heard this wonderful story from several people and even if it’s just a story, it’s a great one! When Raffles was sold in 1999 to Joey Guidotti, who had been a bartender at the Westbury for many years, it was reborn as Tavern on Camac. Steve Carlino and Dennis Fee bought the club from Guidotti in 2004. In the past 8 years they’ve brought new life to TOC, from the dance lounge Ascend at the top, to the cozy restaurant Terra in the basement. Oh, and don’t worry, the traditional TOC piano bar is still there in the middle! As a bonus, they are tremendous supporters of Philadelphia’s LGBTQ community. Last year, the Inquirer featured Carlino in a great article here. Luckily for the Gayborhood, they’ve now expanded their business ventures to include Uncles on Locust St., which they’ve just remodelled, and invested in Tabu on 12th – where I can be seen about once a week having lunch, notebook and camera in hand. 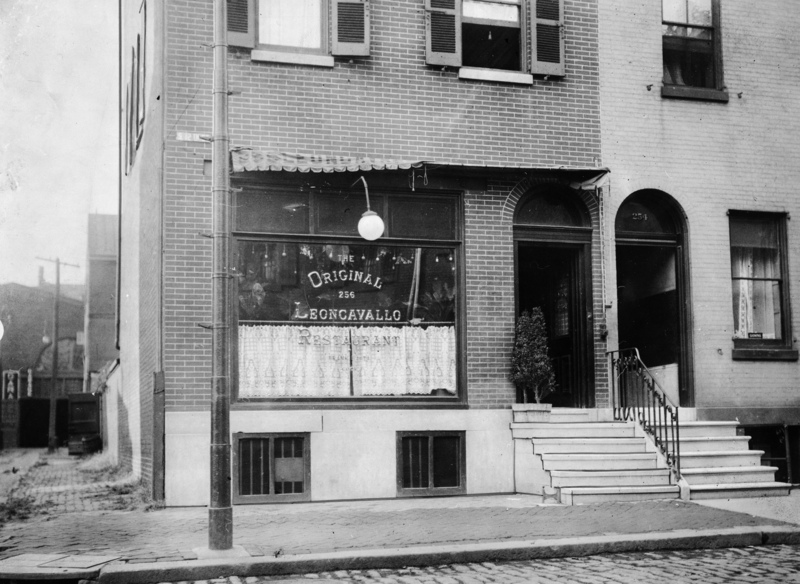 So what’s the oldest gay bar in Philadelphia? With a 90 year history of being a queer-identified space and a well-deserved reputation for being as lively and popular today, my vote would have to go to . . . Tavern on Camac. Cheers, TOC! 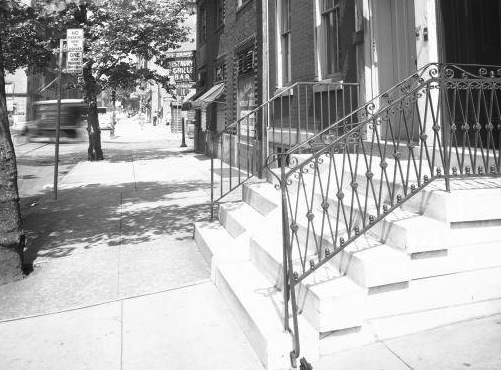 The next stop on the Philadelphia Gayborhood history tour takes us to the corner of 13th and Spruce Streets, toward the southern end of the ‘hood. 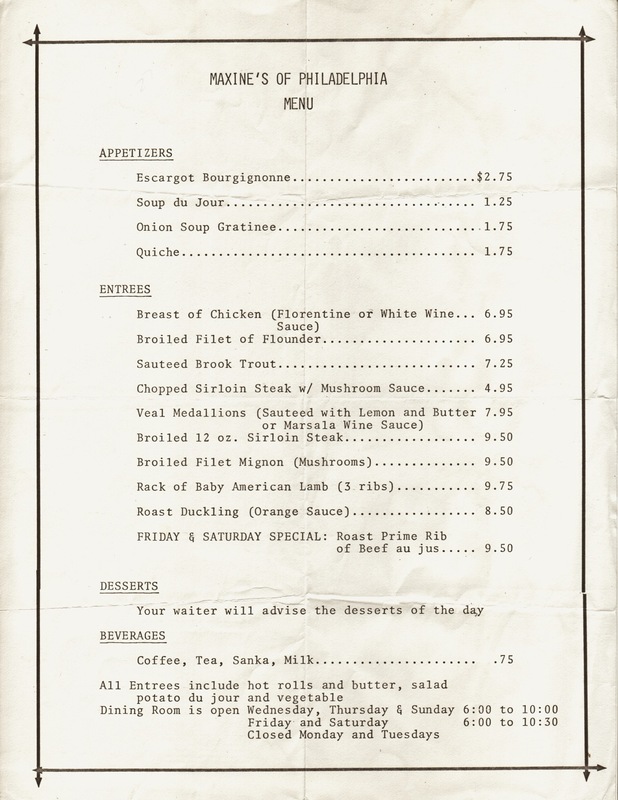 This story tells how the Parker Hotel and the Westbury Bar & Restaurant ended up together. Only a few doors down from the William Way Center, the Westbury is the place you will find us Archives volunteers after an evening of sorting, processing and cataloguing. Busy Thirteenth Street runs north and south and acts as the Gayborhood’s Main Street. The once seedy north end, near Chestnut St., has only recently blossomed into a chic restaurant and shopping row, through a lot of imagination and the hard work of people like Marcie Turney and Valerie Safran. The southern end of the strip, however, is still held back by that 12 story eyesore, the Parker Hotel, at 261 S 13th St. It’s hard to believe that the Parker began life in 1924 as an elegant bachelor apartment building called the Spruce Hotel, left. 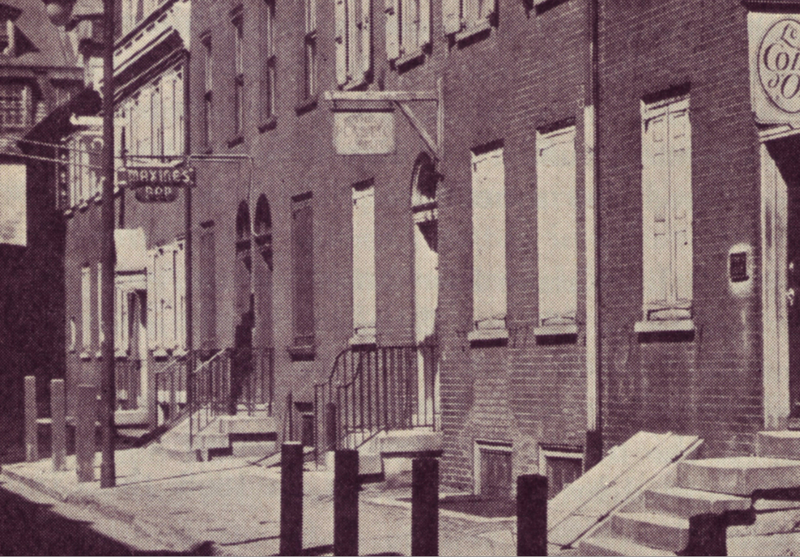 The Spruce contained 209 furnished rooms meant either long term for single males who worked in the downtown city area, or short term for those who were visiting Philadelphia. Each room had a wash basin, a wall cabinet with shelves and either a shared or private bath and shower, which is pretty much true today. 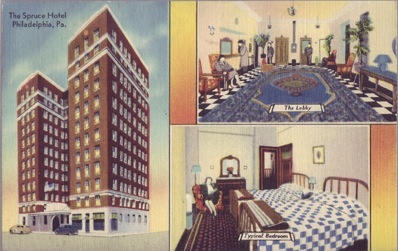 The street level lobby contained a restaurant and lounge and in the basement were a barber shop and laundry, see postcard below. 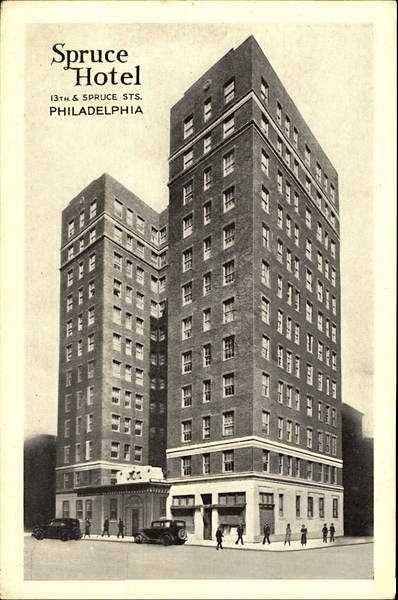 In 1926, when Jack Dempsey fought Gene Tunney at Philadelphia’s Sesquicentennial Municipal Stadium, Tunney stayed at the Spruce Hotel. From the 20s through the 60s, the Spruce Hotel was also a favorite residence for popular musicians staying in the city, including many African Americans. 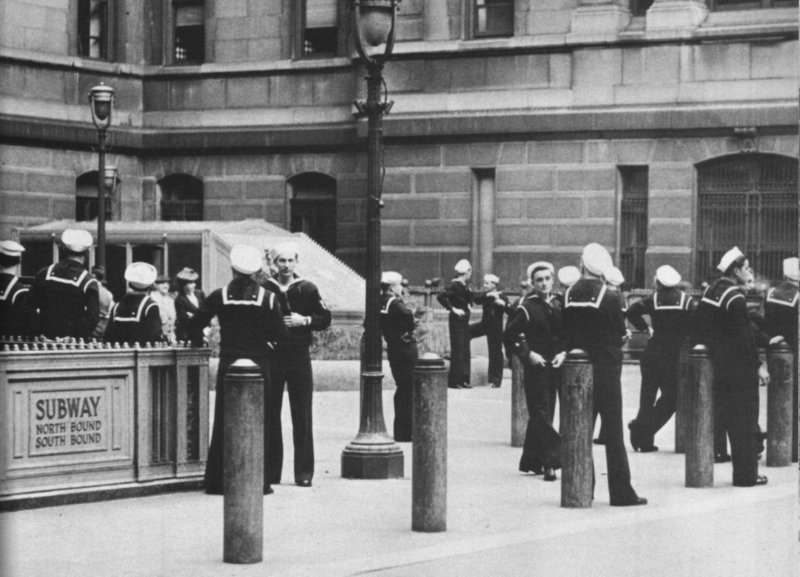 The post-war period in Philadelphia was really a golden age of music bars and dinner clubs; the city was a major stop on the national circuit. 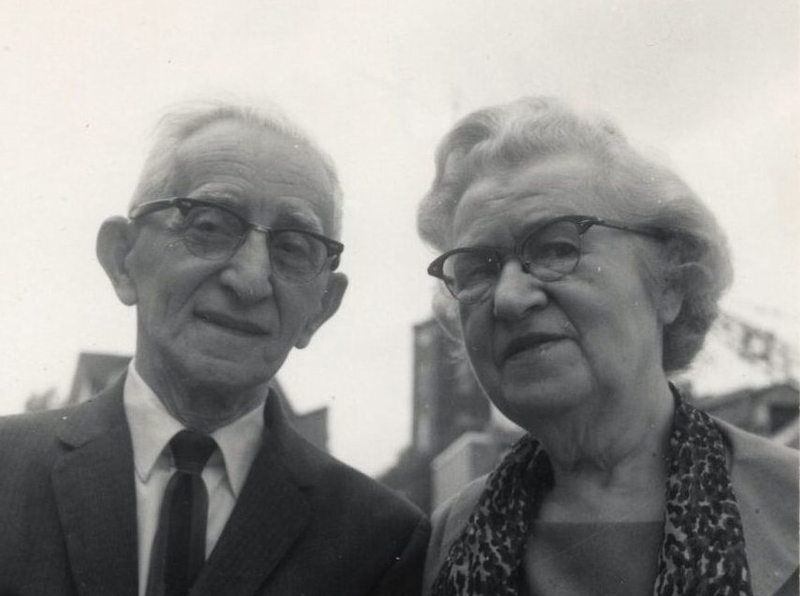 During the mid 1930s, Samuel and Anna Friedman, above, left the drug store they had run on Diamond Street and opened the Spruce Hotel Drugs, later the Parker Hotel Drugs, at the NE corner of 13th and Spruce Streets. The photo below, shows their drugstore and luncheonette in 1960. Many thanks to Stacia Friedman for sharing these photos of her grandparents and their store with me. In the late 1960s, the Friedmans sold the business and the space became a cocktail lounge called The Fireplace Room. 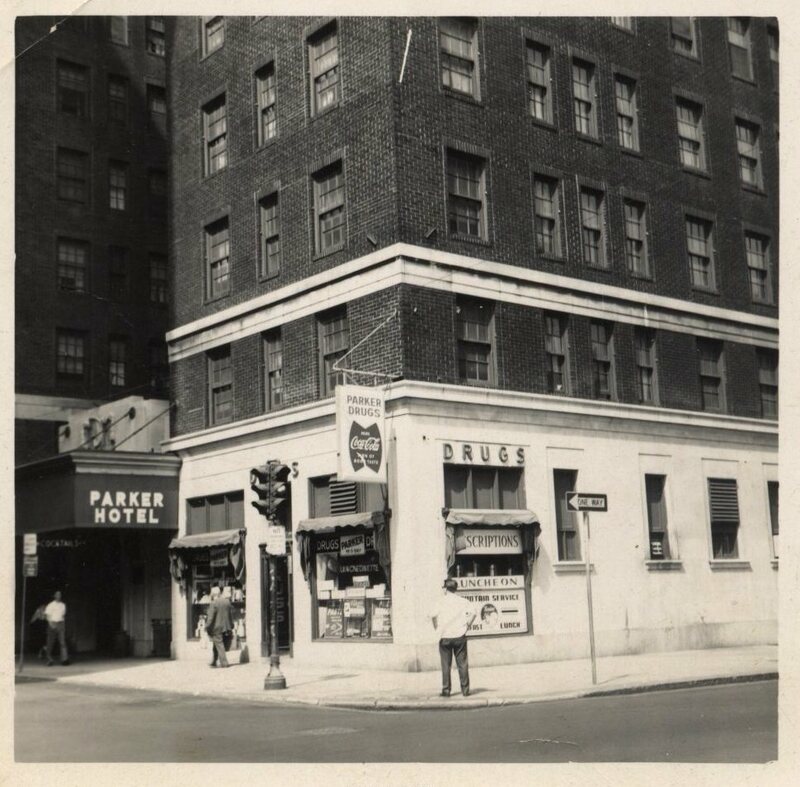 By 1971, the Parker Hotel Bar, as it was now called, was listed in the new national Gayellow Pages as a Philadelphia gay bar. 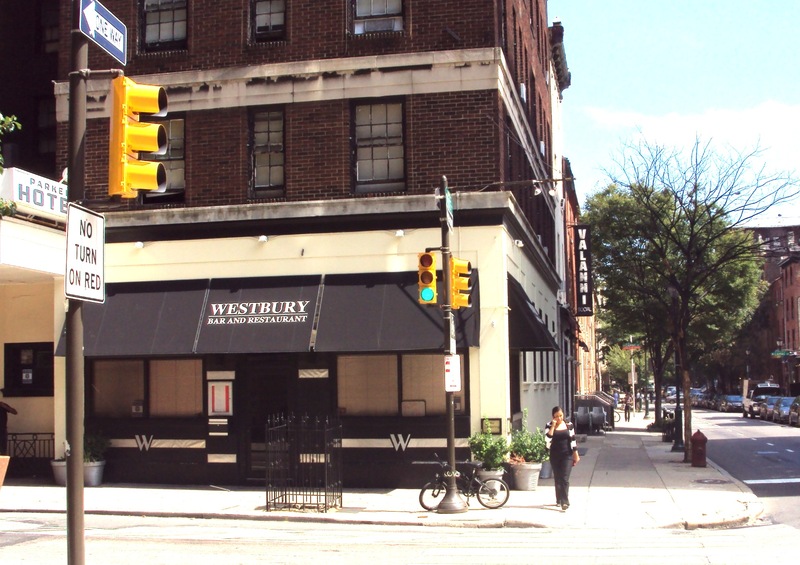 The Westbury began life as the hotel bar of the Westbury Hotel, (later, apartments), at 15th and Spruce Streets. The Westbury Grill, as it was called, was a music bar and restaurant and was frequently mentioned in Billboard Magazine in the 40s. 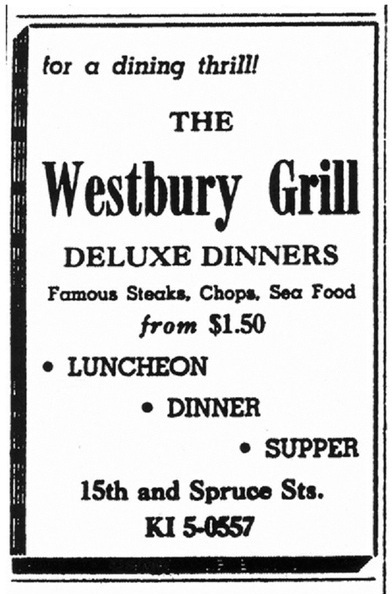 Here’s an ad, right, for the Westbury from 1948, when $1.50 bought a lot more of a dinner than it does today. The bar and restaurant were popular with the theatre and concert crowds from nearby Broad Street. In this photo from 1950, below, which looks west on the north side of Spruce St. toward 15th St., you can just see the “Westbury Grill & Bar” sign through the trees in the upper center. 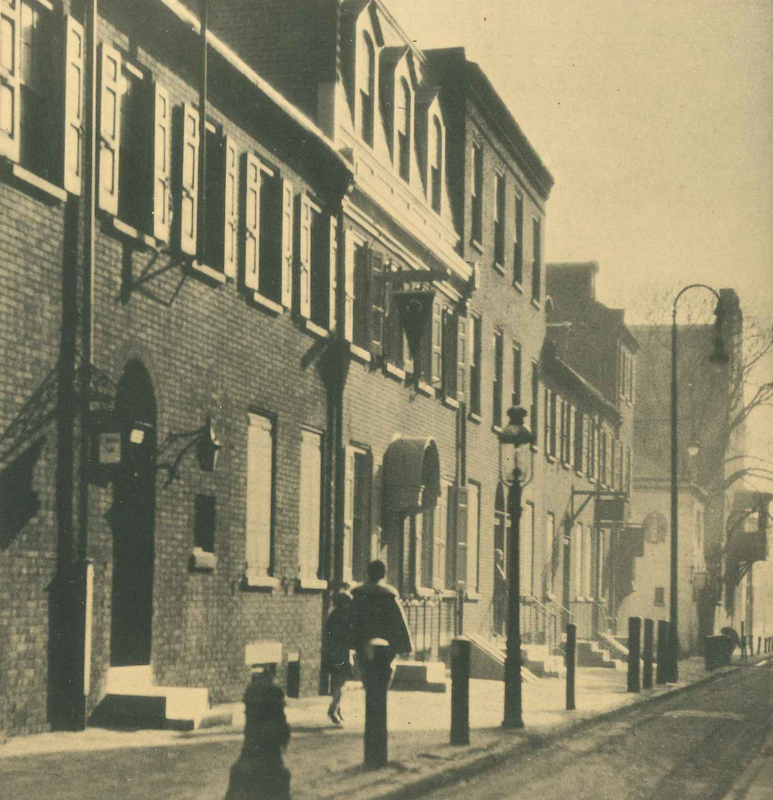 The photo has the same neighborhood feel that the street has today. 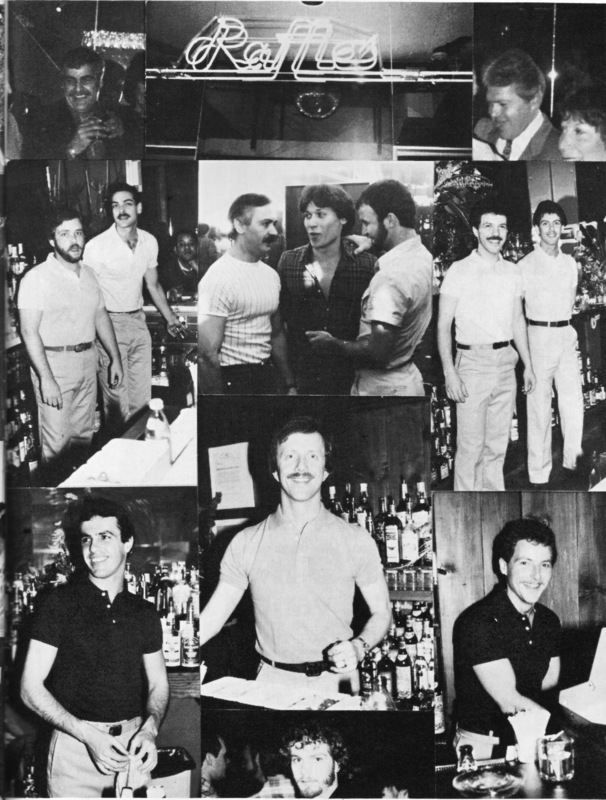 The Westbury Bar began appearing in gay guides about 1962 and by the 70s it became a staple of Philadelphia LGBT nightlife, always listed as “very popular” in those guides. 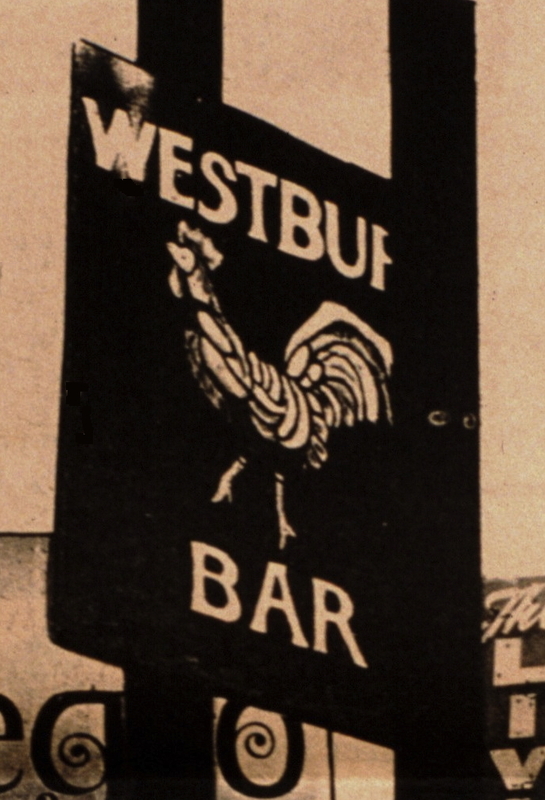 Some of them describe the old Westbury as “semi-leather and denim.” Here’s the sign, left, from the original Westbury on 15th St., circa 1973. That neighborhood thrived in the 70s, with the Allegro on Spruce St. to the east and Roscoe’s to the west and Steps around the corner on Delancey St..
Here’s the corner today, below, with the Westbury Apartments still there, and a shoe repair shop partially occupying the old Westbury Bar space. 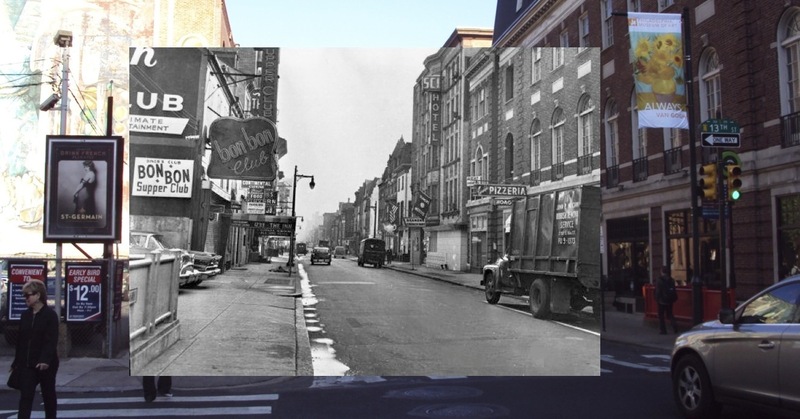 After expanding rapidly in the 70s, Philadelphia’s “gay ghetto” began to shrink in the late 80s, with the epicenter definitely moving toward the 13th St. strip east of Broad, where it would coalesce into today’s Gayborhood. The Bike Stop, Woody’s, Uncles and the 2-4 had all opened east of Broad St. in those years. In 1986, the Westbury made the move and re-opened on the southeast corner of Spruce and 13th Sts. as “The New Westbury,” occupying the old Parker Hotel Bar space. It was the only business to migrate from west of Broad St. to east in that era. The Westbury finally dropped the “New” in 1992. The bar and restaurant were owned by Jack Applegate in the late 90’s and early 2000’s, then for a few years by Ned Katuran. The Westbury has been at its present location for 24 years. Owner Chuck Brault took over management from Ned Katuran in August 2009, when the bar underwent major renovations, morphing into the friendly neighborhood sports bar it is today. On October 20th, 2014 a small fire broke out on the 9th floor of the Parker Hotel and the 12 story building was evacuated. The fire showed that the hotel’s sprinkler system was not up to code and the hotel has been closed. The fate of the building, which is now being sold, is unclear. 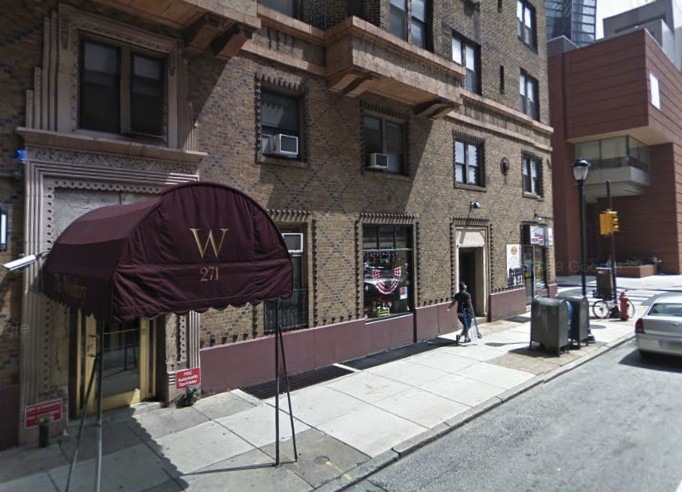 On Friday, November 14, the owner of the Westbury announced that the bar would not re-open and Philadelphia’s shocked LGBT community learned that it has lost one of its oldest bars. Goodbye, Westbury.